There are 8 posts tagged education (this is page 1 of 2). This is starting to beg the question: What parts of our society don’t we consider to be ripe for public-private partnerships yet? Why not work towards a true educational commons which, next to curriculum, also includes process and methodology? Liberian education Minister George Werner announced that the entire pre-primary and primary education system would be outsourced to Bridge International Academies to manage. The deal will see the government of Liberia direct public funding for education to support services subcontracted to the private, for-profit, US-based company.Under the public-private arrangement, the company will pilot the programme in 50 public schools in 2016, as well as design curriculum materials, while phase two could have the company rollout mass implementation over five years, “with government exit possible each year dependent on provided performance from September 2017 onwards,” the report from Liberia’s FrontPage Newspaper said.“Eventually the Ministry of Education is aiming to contract out all primary and early childhood education schools to private providers who meet the required standards over five year period,” the article states. 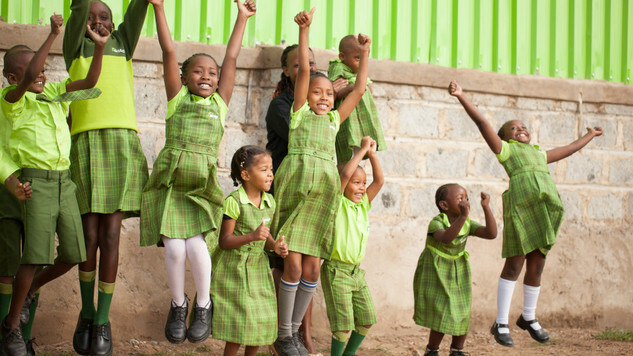 Pupils at a Bridge International Academy in East Africa. In late October I will be attending Elliott Masie’s Learning 2012. Only knowledge workers themselves really know what their jobs entail, which makes providing learning for them increasingly difficult. The level of connectedness in our world and the abundance of suitable technical tools now allow these workers to organize many parts of their own learning. So, what is our role as learning professionals in this new world of “DIY” learning? We can empower our employees to create those tailored learning experiences! It would be great if you could make it to the session. You are more than welcome! Also, I am always interested to meet new people in the world of learning and (open) technology, so do reach out to me if you would like to have a chat in Orlando. I am especially interested in truly innovative uses of learning analytics and networked learning (i.e. a Connectivist pedagogy). It has been a few months since I attended SxSW in Austin. Time to do a bit of reflection and see which things have stuck with me as major takeaways and trends to remember. One thing that we are now slowly starting to understand is how to do things at scale. Virtualized technology allows us to cooperate and collaborate in groups that are orders of magnitude larger than groups coming together in a physical space. The ways of working inside these massive groups are different too. Wikipedia was probably one of the first sites that showed the power of doing things at this new scale (or was it Craigslist?). Now we have semi-commercial platforms like WordPress.com or hyper-commercial platforms like Facebook that are leveraging the same type of affordances. The teaching profession is now catching on too. From non-commercial efforts like MOOCs and the Peer 2 Peer university to initiatives springing from major universities: Stanford’s AI course, Udacity, Coursera, MITx to the now heavily endowed Khan Academy: all have found ways to scale a pedagogical process from a classroom full of students to audiences of tens of thousands if not hundreds of thousands. They have now even become mainstream news with Thom Friedman writing about them in the New York Times (conveniently forgetting to mention the truly free alternatives). I don’t see any of this in Corporate Learning Functions yet. The only way we currently help thousands of staff learn is through non-facilitated e-learning modules. That paradigm is now 15-20 years old and has not taken on board any of the lessons that the net has taught us. Soon we will all agree that this type of e-learning is mostly ineffectual and thus ultimately also non-efficient. The imperative for change is there. Events like the Jams that IBM organize are just the beginning of new ways of learning at the scale of the web. The future of how we will soon all work is already on view in many small companies around the world. Automattic blew my mind with their global fully distributed workforce of slightly over a hundred people. This allows them to truly only hire the best people for the job (rather than the people who live conveniently close to an office location). All these people need to start being productive is a laptop with an Internet connection. Automattic has also found a way to make sure that people feel connected to the company and stay productive: they ask people to share as much as possible what it is they are doing (they called it “oversharing”, I would call it narrating your work). 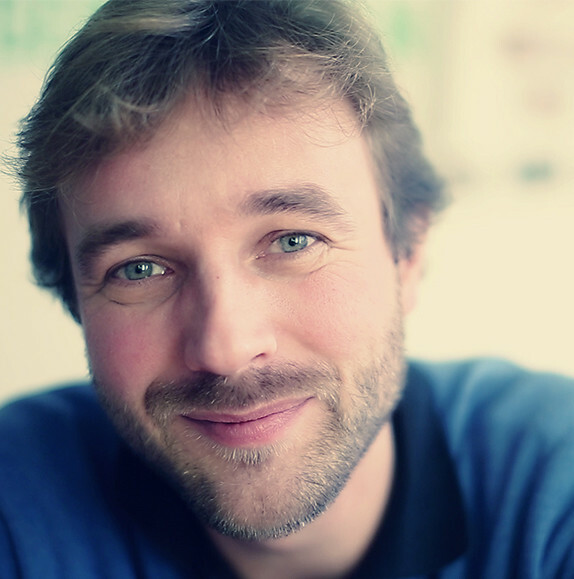 There are some great lessons there for small global virtual teams in large companies. The smallest company possible is a company of one. A few sessions at SxSW focused on “free radicals”. These are people who work in ever-shifting small project groups and often aren’t very bounded to a particular location. These people live what Charles Handy, in The Elephant and The Flea, called a portfolio lifestyle. They are obviously not on a career track with promotions, instead they get their feedback, discipline and refinement from the meritocratic communities and co-working spaces they work in. Personally I am wondering whether it is possible to become a free radical in a large multinational. Would that be the first step towards a flatter, less hierarchical and more expertise-based organization? I for one wouldn’t mind stepping outside of my line (and out of my silo) and finding my own work on the basis of where I can add the most value for the company. I know this is already possible in smaller companies (see the Valve handbook for an example). It will be hard for big enterprises to start doing this, but I am quite sure we will all end up there eventually. One trend that is very recognizable for me is hyperspecialization. When I made my first website around 2000, I was able to quickly learn everything there was to know about building websites. There were a few technologies and their scope was limited. Now the level of specialization in the creation of websites is incredible. There is absolutely no way anybody can be an expert in a substantial part of the total field. The modern-day renaissance man just can’t exist. Transaction costs are going down everywhere. This means that integrated solutions and companies/people who can deliver things end-to-end are losing their competitive edge. As a client I prefer to buy each element of what I need from a niche specialist, rather then get it in one go from somebody who does an average job. Topcoder has made this a core part of their business model: each project that they get is split up into as many pieces as possible and individuals (free radicals again) bid on the work. Let’s assume that this trends towards specialization will continue. What would that mean for the Learning Function? One thing that would become critical is your ability to quickly assess expertise. How do you know that somebody who calls themselves and expert really is one? What does this mean for competency management? How will this affect the way you build up teams for projects? 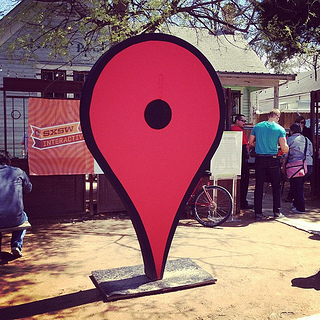 Everybody was completely focused on mobile technology at SxSW. I couldn’t keep track of the number of new apps I’ve seen presented. Smartphones and tablets have created a completely new paradigm for interacting with our computers. We have all become enamoured with touch-interfaces right now and have bought into the idea that a mobile operating system contains apps and an appstore (with what I like to call the matching “update hell”). Some visionaries were already talking about what lies beyond the touch-based interface and apps (e.g. Scott Jenson and Amber Case. More than one person talked about how location and other context creating attributes of the world will allow our computers to be much smarter in what they present to us. Rather than us starting an app to get something done, it will be the world that will push its apps on to us. You don’t have to start the app with the public transport schedule anymore, instead you will be shown the schedule as soon as you arrive at the bus stop. You don’t start Shazam to capture a piece of music, but your phone will just notify you of what music is playing around you (and probably what you could be listening to if you were willing to switch channel). Social cues will become even stronger and this means that cities become the places for what someone called “coindensity” (a place with more serendipity than other places). This is likely to have profound consequences for the way we deliver learning. Physical objects and location will have learning attached to them and this will get pushed to people’s devices (especially when the systems knows that your certification is expired or that you haven’t dealt with this object before). You can see vendors of Electronic Performance Support Systems slowly moving into this direction. They are waiting for the mobile infrastructure to be there. The one thing we can start doing from today is to make sure we geotag absolutely everything. One step further are brain-computer interfaces (commanding computers with pure thought). Many prototypes already exist and the first real products are now coming to market. There are many open questions, but it is fascinating to start playing with the conceptual design of how these tools would work. Just before SxSW I had the opportunity to spend two days at the amazing Applied Minds. They solve tough engineering problems, bringing ideas from concept to working prototype (focusing on the really tough things that other companies are not capable of doing). What was surprising is that about half of their staff has an artistic background. They realise the value of story. I’m convinced there is a lot to be gained if large engineering companies would start to take their diversity statements seriously and started hiring writers, architects, sculptors and cineasts. Call it confirmation bias (my regular readers know I always prefer “open”), but I kept seeing examples at SxSW where open technology beats closed solutions. My favourite example was around OpenStreetMap: companies have been relying on Google Maps to help them out with their mapping needs. Many of them are now starting to realise how limiting Google’s functionality is and what kind of dependence it creates for them. Many companies are switching to Open Street Map. Examples include Yahoo (Flickr), Apple and Foursquare. Maybe it is because Google is straddling the line between creating more value than they capture and not doing that: I heartily agree with Tim O’Reilly and Doc Searl‘s statements at SxSW that free customers will always create more value than captured ones. Don’t engage with Yammer and let people just keep using it without paying for it. This creates unacceptable information risks and liability. Not an option. Tell people that they are not allowed to use Yammer. This is possible in theory, but would most likely enrage users, plus any network blocks would need to be very advanced (blocking Yammer emails so that people can’t use their own technology to access Yammer). Not a feasible option. Bite the bullet and pay for the network. Companies are doing this in droves. Yammer is acquiring customers straight into a locked-in position. SaaS-based solutions are outperforming traditional IT solutions. Rather than four releases a year (if you are lucky), these SaaS based offerings release multiple times a day. They keep adding new functionality based on their customers demands. I have an example of where a SaaS based solution was a factor 2000 faster in implementation (2 hours instead of 6 months) and a factor 5000 cheaper ($100 instead of $500,000) than the enterprise IT way of doing things. The solution was likely better too. Companies like Salesforce are trying very hard to obsolete the traditional IT department. I am not sure how companies could leverage SaaS without falling in another lock-in trap though. One lesson that I learned during my trip through the US is that affluence is not a good situation to innovate from. Creativity comes from constraints (this is why Arjen Vrielink and I kept constraining ourselves in different ways for our Parallax series). The African Maker “Safari” at SxSW showed what can become possible when you combine severe resource constraints with regulatory whitespace. Make sure to subscribe to Makeshift Magazine if you are interested to see more of these type of inventions and innovations. I believe that many large corporations have too much budget in their teams to be really innovative. What would it mean if you wouldn’t cut the budget with 10% every year, but cut it with 90% instead? Wouldn’t you save a lot of money and force people to be more creative? In a world of abundance we will need to limit ourselves artificially to be able to deliver to our best potential. There is precious few people in the world who have a deep understanding of education. 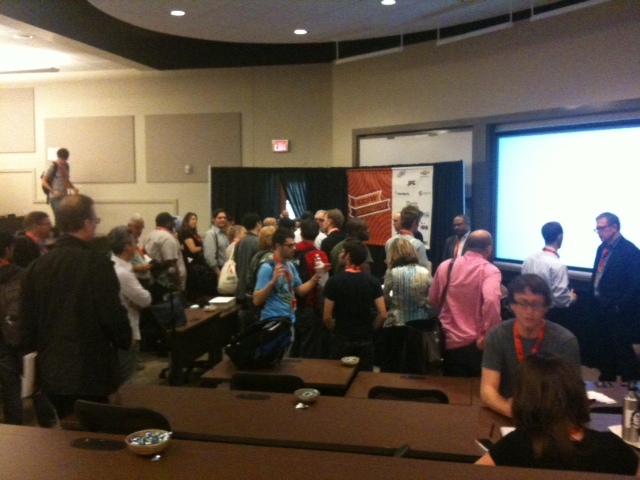 My encounter with Venture Capitalists at SxSW talking about how to fix education did not end well. George Siemens was much more eloquent in the way that he described his unease with the VCs. Reflecting back I see one thing that is most probably at the root of the problem: most people still equate education/learning to content. I see this fallacy all around me: It is the layperson’s view on learning. It is what drives people to buy Learning Content Management Systems that can deliver to mobile. It is why we think that different Virtual Learning Environments are interchangeable. This is why we think that creating a full curriculum of great teachers explaining things on video will solve our educational woes. Wrong! My recommendation would be to stop focusing on content all together (as an exercise in constraining yourself). Who will create the first contentless course? Maybe Dean Kamen is already doing this. He wanted more children with engineering mindsets. Rather than creating lesson plans for teacher he decided to organise a sport- and entertainment based competition (I don’t how successful he is in creating more engineers with this method by the way). So far for my reflections. A blow-by-blow description of all the sessions I attended at SxSW is available here. Mitch Kapor (Kapor Capital), Philip Bronner and Robert Hutter, moderated by Betsy Corcoran started by framing the problem with current education. Each of the speakers showed shocking graphs of educational attainment, inequity and the job market. Philip Bronner immediately lost my intellectual respect when he started talking about how Novak Biddle invested in Blackboard around 15 years ago turning Blackboard into the de facto operating system of education. I do hope that this isn’t true. If it is, then I would consider that an affirmation of the problems, rather than part of the solution. Bronner then went on to define education as consisting of three pieces: content, somebody who teaches you the content and a way to certify that you know the content. Education as content: pretty shocking. Hutter talked about data (Kapor would call them “anecdotes”) about programs that make good use of digital tools getting objective better results. It is Hutters goal to help scale up this programs and the last three years two things have happened that will have a big impact in this: campus wifi is everywhere now and batteries have made a humongous leap forward. This whole panel is a complete mystery to me (to not call it surreal). Discussing education as if it is a market just sound plain wrong. I believe that the one thing that should have been discussed is the question of the actual purpose of education and who is responsible for providing it. I would suspect that each of the panelists would give a very different answer to that question and that I would have a fourth answer. They seemed to be discussing the wrong leverage points (Kapor started addressing it when he talked about how affluent the US has become and that technolology is necessary but not sufficient to solve the problems). I would have loved to hear what the panelists would say and think about this New York Times piece on education in Finland. The Wikipedia is impossible, but here it is. It is one of those things impossible in theory, but possible in practice. I couldn’t agree more: the scope of Wikipedia’s success is stupefying to me. The project can teach us many things about how we can utilise small inputs from many to create something grand. Ayers, Matthews and Yates have written How Wikipedia Works: And How You Can Be a Part of It and made it a free cultural work by licensing it under the GNU Free Documentation License. The complete book is freely available online at http://howwikipediaworks.com/. They have managed to truly deliver on both meanings of the title. 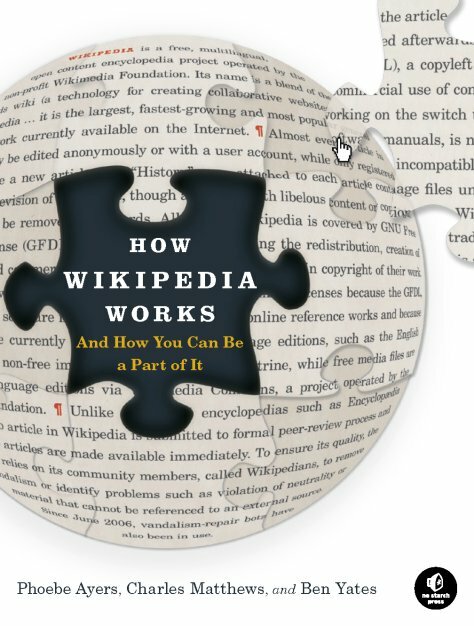 The book gives an in-depth explanation of how Wikipedia literally works (i.e. the syntax, the software, categories, templates and more) and how it can work as a community based collaborative effort (through philosophies, guidelines, processes and policies). Wikipedia is an encyclopedia (not anything else). Wikipedia has a neutral point of view. Wikipedia does not have firm rules. (The editing community can change the rules, this is also known as Ignore all rules). The book is very valuable for educators. One of the best chapters outlines how to evaluate the quality of an article. By using different techniques, including looking at the history of a page, checking the backlinks to an article, taking account of the warning messages and verifying the sources, you can quickly judge the value of the information (for more on this see Researching with Wikipedia). Teaching students how to do this could push the discussion about allowing students to use Wikipedia as a source for research to another level. Even more interesting is make working on Wikipedia an assignment for your students. If I was teaching in tertiary education right now, I would be sure to do this. It will teach students more valuable skills than an essay only written for the professor’s eyes could ever do. There is group of Wikipedians happy to help and set up these kind of projects. In short: read this book! Pediapress. A print on demand service for selections of Wikipedia articles. Create your own books by picking the articles you like to have in it and have it shipped to you for a very reasonable price. Selections by others are available through their catalogue. Try Educational Technology for example. The fundamental fallacy of instruction creep is thinking that people read extremely long, detailed instructions. What’s more, many bureaucracies also arise with the deliberate intent to be alternatives to regulations; this is almost always noticed by the other side, and tends to antagonize. Something to always stay aware of!